I’ll be in London in just a few days and I am so excited. I know that all the security experts say that you shouldn’t tweet or Facebook your whereabouts, much less talk about them in a blog for strangers and potential burglars to read, but I’m not worried. Since I am traveling on my own this time, I am leaving behind a vicious guard dog and a houseful of giant men armed with big burglar shooting guns to guard our house, so I'm really not too worried about posting this here. Shortly after I finalized my plans to return to the UK after a two year hiatus, I went with a few other local bloggers to a carbohydrate tasting at Fado Irish Pub. Even though I’d been on the South Beach diet for two weeks at this time (and not losing weight anyway), I figured this would be a good place to start training to get in shape for all the lager drinking and fish and chip eating to come. Finding Fado was kind of a challenge. After we circled around their general vicinity several times refusing to believe the GPS (it has been known to lie before), we finally arrived at our destination, right where the GPS said it would be. In our own defense, there was the usual HUGE downtown distraction of pedestrians who think they own the crosswalks, and Fado’s sign is just about a foot too small to be seen when you are whizzing by trying to avoid said pedestrians at 30 mph. Finally parked and needing a drink, we walked inside Fado and instantly felt like we had been transported to Dublin. The pub has a dark, warm and welcoming ambiance complete with a roaring fire, ebony wood bar and its own friendly resident Irishman named Glen Eastwood there to greet us. Once seated, Glen, who is the General Manager of this location, explained to us that this location is only 1 of 14 Fado Irish Pubs around the US. Their authentic look and feel comes from the fact that their founder Kieran McGill at one time worked for IPC (Irish Pub Company), which designs and builds authentic looking Irish pubs around the world. After breaking away from them in 1996 he started his first pub in Atlanta and the company grew from there. To stay true to their Irish roots, Fado (which by the way, means “long ago” in Gaelic) has the same imported beers on tap and in their coolers that you would find in a pub in Ireland. If you are thirsty for a European lager or stout, if is most likely available here as their import selection is truly amazing. In addition to their extensive selection of beers they also carry a wide variety of ciders, wines and spirits. Since man cannot live by drink alone, they also have a nice size menu with a selection of pub food ranging from lighter soups and salads to traditional hearty Irish fare including homemade shepherd’s pie (which, and I hate to nitpick here, is really cottage pie because it is made with beef instead of lamb), corned beef and cabbage, and an all-day Irish breakfast just to name a few. For our tasting we were served a sampling of some of Fado's delicious dishes including, a Smoked Salmon Bite which is smoked salmon atop a crisp Irish boxty, with capers, onions, horseradish sauce and lemon; a mini Shepherd’s Pie made with colcannon (Irish mashed potatoes with cabbage); and one of their Bleu Cheese Lamb Sliders which is tender shredded lamb, caramelized onion, bleu cheese and green onions on slider buns served with lamb jus for dipping. They were all very good. To compliment these dishes, Glen poured us three delicious ice cold beers that he chose especially to go with each one. It is a good thing that Fado is across town from me, because I could really get used to this. Of course with St. Patrick's Day just around the corner, Fado is gearing up for their busiest time of year, but I am here to tell you that you don't have to wait for a special occasion to enjoy some authentic Irish pub food and drink. Fado is open for lunch and dinner on weekdays and brunch on weekends. For more information on their menu, St. Patrick’s Day festivities, locations, hours of operation, etc. click here to access their website. Although a really tough decision, my favorite dish at this tasting had to be the Smoked Salmon Bites. Served on a little Irish potato pancake called a boxty, these delicious bites were a perfect combination of smokey salmon, crispy potato pancake and lemon. I’m sad to say that I got away from Fado that day without getting the recipe, but happy to say that I managed to make a pretty close copy. Fado’s original recipe is made with cold smoked salmon with capers, onions and a light horseradish sauce with lemon. My version is made with my favorite hot smoked salmon, green onions and a lemony mayonnaise with Serrano pepper, all piled on top of my own homemade boxties; different but just as delicious. To assemble: Spoon desired amounts of the salmon onto the top of each boxty. Drizzle the mayo on top of the salmon followed by a sprinkling of green onions. I found several recipes for boxties. Some called for a thinner batter and some called for a thicker, dough like texture. I went for the thinner batter wanting to come out with more of a crepe than a cake. Authentic or not, these were just like Fado's, crispy and delicious. Toss the grated potato, flour, salt and baking powder together in a large bowl. Add the mashed potatoes, alternating with the milk about 1/3 at a time until a thick-ish yet pourable consistency is reached. Heat 1/4 of a cup of oil in a large frying pan over medium high heat; drop rounded teaspoons of the boxty batter into the hot pan, flattening out slightly with the back of a spoon. Fry for 3 minutes or so or until they are golden brown, flip and repeat on the other side. Keep boxties warm while you fry the remaining batter, adding more oil as needed. 3 tablespoons freshly squeezed lemon juice (I used Meyer lemon juice which is milder so you may not need quite 3 tablespoons when using regular lemons. Just add to taste). Combine all the ingredients in a medium size bowl. Cover and chill until ready to use. *Photos of the interior of Fado and their All-Day Irish Breakfast are from Fado's website. I only wish my photos came out this good that night. It’s a new day around the Harris household. Ever since I got sick of seeing that chubby girl who stalks me, staring back at me in the mirror, our dinner table has looked much different. Yes siree, I’ve got to get rid of her because she’s really starting to bum me out. Little did I realize how many carbs we consumed each day until I started this new diet. For the first 2 weeks we (when mama’s on a diet, everyone’s on a diet) were on full carb lockdown and I’m proud to say, doing pretty well until that Irish pub Guinness and cottage pie tasting a couple of nights ago. I’ve since forgiven myself and I got right back up on that horse and picked up where I left off. It really hasn’t been all that bad with maybe one or two exceptions. I’ve been eating lots and lots of veggies and lean meats, low fat cheese and for a treat (this is where the trouble comes in), low-fat cottage cheese sprinkled with Splenda (weird and yuck!). You may think me picky, but there is nothing about that that says "treat" to me. 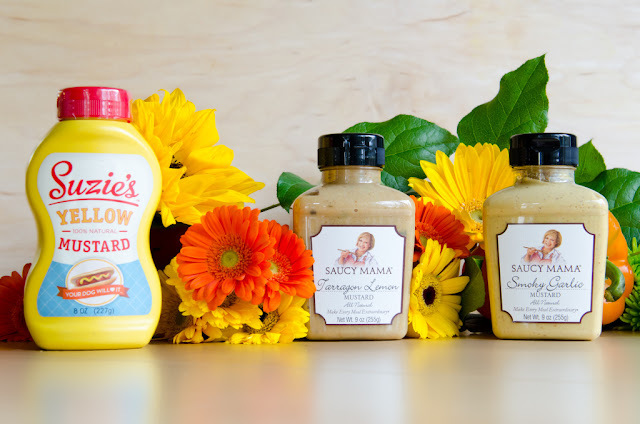 With all this healthy eating going on it was really a great time to be asked by Saucy Mama if I would like to participate in their Saucy Mama’s “ Skinny Mama – Cooking with Mustard” Contest. The competition is for bloggers to write a diet friendly recipe that incorporates some of their mustard, and since I’m in the thick of South Beach, this is a welcomed diversion to get my mind off of sugar and flour. To get me started, Saucy Mama supplied me with a blogger kit containing 6 different mustards that includes their Dijon, Champagne Honey, Tarragon Lemon, Smoky Garlic, Chipotle, and Suzie’s Plain Yellow to play with and craft my recipe. Now, I’m not an expert on this diet but I know that eggs are allowed and so is mustard, reduced fat cheese, herbs and a little turkey bacon every now and then. I mulled these ingredients over in my mind for a few days and came up with a recipe that I’d actually be quite proud of even if I wasn’t on a diet which is my favorite type of recipe. My French Hens are a cross between a souffle, an omelette and a quiche. The mustard, herbs and cheeses really kick up the flavor to make this a super satisfying South Beach Diet friendly dish. The bonus here is, you'll love these even if you're not on a diet. Spray a six section extra-large muffin pan with non-stick cooking spray. Place two halves of the turkey bacon in the bottom of each section in an “x” pattern. Top the turkey bacon with one slice of the cheese, pressing it into the bottom of each section; set aside. Place the egg yolks in a medium size bowl. To the egg yolks add the mustard, herbs, garlic, salt, pepper and 2 tablespoons of the parmesan cheese; stir well and set aside. In a large bowl, beat the egg whites to stiff peaks. Gently fold in the yolk mixture, mixing until it is completely combined. Spoon equal amounts over the top of the bacon and cheese in the muffin pan. Sprinkle the tops with the remaining Parmesan cheese. Place into the preheated oven and bake for 15 minutes or until eggs are firm. Remove from the oven and serve immediately as they will start to deflate right from the oven. This will not affect the flavor. If you'd like to sample Saucy Mama's mustards, they have made a sampler package like the one above available for me to give to one of my followers. If you'd like to be entered into this giveaway, please comment on this blog below. Random.org will choose my winner on February 28, 2012 around noon. A couple of weeks ago the blogger group I belong to was invited to a dinner at the Rio Grande restaurant in downtown Denver. Hosted by Owner, Pat McGaughran; CEO, Jason Barrett; and Food and Beverage Director, Steve Richter, they wanted to unveil some of their dishes from their new and improved menu and were hoping that we’d help spread the word to our readers. Pat McGaughran started the evening off by giving us a little history of the restaurant. He explained that he started his business back in 1986 with two of his childhood friends from Houston. After wandering around the US, Mexico and Central America the three of them found themselves sleeping on the floor in the apartment of one of their big sisters who was a college student at Colorado State in Fort Collins. After a while she tired of their company and basically told them to get a haircut and get a real job (or something like that). Faced with the reality of adulthood, they did what many of us only dream of; they started making margaritas and Mexican food and selling them. And sell them they did. Long story short, a bazillion margaritas later, there are now six locations across Colorado. Although proud of their reputation for serving some of the best margaritas in Colorado, they would now like to expand this reputation to their food. For 2012 they have assembled new culinary talent, sourced better ingredients and refined recipes in an effort to give their customers the best from scratch food around. Now I have to be honest here and tell you I’ve had some really poor Mexican food since moving to Colorado from Texas. We often say that the only thing that we can count on is being disappointed when looking for a decent cheese enchilada in this state. Well, no more. After mentioning that this is my personal litmus test of any Mexican restaurant, I was presented with a delicious cheesy enchilada doused in a rich brownish red enchilada sauce. Mmmmm, just like Houston. First test passed. Our tasting then continued with a spicy and fresh Shrimp Diabla, which was perfectly cooked shrimp in a fiery chile de arbol sauce, which I must say goes quite nicely with one (or two) of their fruity frozen strawberry margaritas. We were then presented with a crispy salad selection with a variety of dressings, fresh from scratch guacamole, tender locally sourced beef fajitas, hand-pressed homemade tortillas and hot and cheesy chile con queso so good that even my 17 year old chile con queso snob of a son would love it. I know that we were served more, but by this time my second margarita was kicking in and it was all a blur from that point on . . . until dessert. As if I needed to stuff myself with anything more, I couldn’t resist dipping my spoon into their chocolate crème brulee which, after cracking through the crisp sugary layer, yielded a smooth and creamy, chocolaty custard with just a hint of ancho chile. By this time I was so full that I could only manage to humor my hosts by taking a couple of bites of my usual favorite, sopapillas. The Rio’s sopapillas are made from some of their fresh dough fried and served with honey. Sometimes the simpliest things are the best, especially when they are served with a scoop of vanilla ice cream. So, if you find yourself in the beautiful state of Colorado and you have a craving for some wonderful Mexican food, give the Rio Grande a try; or if it’s been awhile since you’ve visited one of their locations, be sure to stop by and check out their new menu items. Oh yeah, I’m sure I don’t need to remind you but I will anyway, be sure to have one of those famous margaritas while you're there. Since I have a policy of always adding a recipe at the end of my posts, the Rio was good enough to give me their recipe for their DELICIOUS spinach enchiladas. I just love the addition of yellow squash. It really adds a pleasant texture to a dish that sometimes needs just that little added something. One other note, this calls for 10 enchiladas containing 1/2 cup of the filling. This makes a really super fat enchilada so this recipe could easily be stretched to make 14 - 16 enchiladas. Heat corn tortillas on a hot griddle; quickly top each tortilla with 1/2 cup of the spinach mix. Roll the filled tortilla and place in a greased 15 x 10” baking dish. Repeat with the remaining tortillas and spinach mix. Cover the enchiladas evenly with the tomatillo sauce, working quickly so that the tortillas do not dry out and split. Sprinkle all of the cheese over the enchiladas and bake for 15 minutes. After 15 minutes, turn the oven to broil and watching closely, brown the cheese. Serve immediately. Cut squash and red onions into 1/2" cubes; set aside. Heat oil in a large stock pot over medium heat; add the squash and onions to the hot oil and sauté until they are slightly softened (about 4 – 6 minutes). Add the garlic and cook for 1 minute longer before adding the spinach (I had to add my spinach in batches because my pot wasn't big enough to fit all of it in at once. This worked great just stir it well before and after each addition). Mix well, cover and reduce heat slightly; cook for approximately 2 minutes or until the spinach turns a bright green. Remove the mixture from the heat and add the cubed cream cheese, mixing gently until it is dissolved and the mixture resembles spinach dip. Ok, I’m going to be honest with you guys from the start. I had full intentions of making this from scratch like they do at the Rio, but the tomatillos at my local supermarket were very small, hard as rocks and super expensive. To be quite honest, I landed up buying a 16 ounce jar of prepared salsa verde and mixing it with the sour cream to make my sauce. I am happy to report that it was very good. So if you have a hard time finding tomatillos, use this as your Plan B.
Roast the tomatillos in a hot 350 – 400 degree oven until they turn an olive color (10 – 15 minutes). Cool them to room temperature. Add all the ingredients except the sour cream into the blender and mix thoroughly. In a mixing­­­­­­­­ bowl place the blended tomatillo mixture and sour cream. Gently mix the two together; set aside. For the month of February Abby Dodge has chosen a beautiful creamy cheesecake for her #baketogether (for Abby's original recipe, click here). I was really happy to see this since I have been looking for an excuse for months now to make a dish from one of my favorite comfort food stops in Texas, Luby’s Cafeteria. Feeling inspired by both of these recipes, I decided to blend elements of both and throw in a couple of my own ideas into the mix coming up with a delightful cake and a fun way to serve it and share it with friends. When I was a teenager I loved going to Luby’s Cafeteria with my parents. I was always in the mood to dine on their perfect macaroni and cheese along with a big rectangular piece of cracker crumb breaded fried fish topped with a generous dollop of creamy tartar sauce. Mmmmm, perfection. In my twenties this was the place to go to gorge on vegetables to revitalize my body after a long weekend of partying. At this time my favorite was Luby’s stuffed bell peppers, which from what I could tell were made with chopped leftover roast beef and were no less than a culinary triumph. Serve these with a side of fried okra and a little white bowl filled with mashed potatoes and you are in comfort food heaven. Years later I enjoyed taking my own children there and treating them to their own favorites which were coincidentally enough, macaroni and cheese and fried fish. They just loved the place. I guess there is just something about 25 yards of steam tables and hairnet clad servers saying, “Serve you?” that just makes a child’s heart sing. Things haven’t changed much through the years. You still slide your tray down the long silver bar of the food line past the salads, entrees and sides. At the end of the line right before you reach the individually wrapped cream cheese stuffed jalapenos and bowls of colorful cubed Jell-O, there lies the always impressive selection of desserts. Most often I was a coconut pie girl, but on occasion when I felt like taking a walk on the wild side, I would change things up and get a piece of their fluffy and creamy no bake cheesecake. The simple combination of a crushed graham cracker crumb crust topped by a “light” combination of whipped cream and cream cheese, was just the perfect ending to a 3000 calorie chicken fried steak dinner. Even though I miss it, maybe it’s a good thing they don’t have Luby’s in Colorado because it is obvious that I just have no willpower. Place almonds in a frying pan over medium high heat. Stirring frequently to prevent burning, toast the almonds until they are a golden brown and their aroma is released. Transfer to a plate to cool and set aside until ready to use. Place Biscoff cookies in the bowl of a food processor and process until finely ground or alternatively place in a heavy duty bag and crush with a rolling pin. Combine the Biscoff crumbs, toasted almonds, sugar, and cinnamon. Stir well before removing 1 cup of the mixture and setting aside. Melt 3 tablespoons of the butter and add it to the remaining cookie mixture in the bowl; stir well. Press the crumbs that were mixed with the butter into the bottom of a 9” pie plate or press 1/4 cup of the mixture into the bottom of each of 8 wide mouth 1/2 pint Mason jars. Place the pie plate into the preheated oven or if using the Mason jars, place them in a large baking dish and pour enough boiling water into it to make a water bath that comes 1” up the outside of the jars; bake for approximately 10 – 12 minutes or until they are aromatic and golden brown. Remove from the oven and cool completely. In a large bowl, blend together the cream cheese, the remaining butter, mascarpone, powdered sugar, salt, vanilla extract and amaretto; blend well. Gently fold in the whipped cream until completely incorporated. Spread the cheese mixture evenly over the cooled crust in the pie plate or Mason jars. Cover and refrigerate for 3 – 4 hours or preferably overnight. Sprinkle equal amounts of the remaining cookie crumbs over the top of the cheesecake before serving. Serve plain or with fresh fruit. Store in the refrigerator. My friends and family love receiving these little cheesecake jars. The lids can easily be decorated to fit any occasion or season. I thought it might be fun to enter this in the Valentine's Day contest over at Very Good Recipes. If you'd like to get other great ideas or see who wins, please visit the website by clicking on the address http://verygoodrecipes.com/be-my-valentine-challenge.